LAS VEGAS — 166 Auto Auction in Springfield, Mo., has earned two major awards from two national automotive remarketing consignors, continuing a trend that began in 2015. An Auction Management Solutions (AMS) member auction, 166 Auto Auction was awarded the Consumer Portfolio Services (CPS) Top Gun Award, and the Credit Acceptance/VRS National Medium Volume Auction of the Year Award. 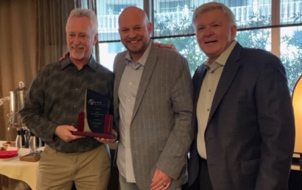 The awards were presented during the 2019 Conference of Automotive Remarketing (CAR) held March 26-27 in Las Vegas. Originally founded in 1949, the bustling eight-lane auction, 42,000 square foot body shop, and 10,000 square foot, 10-bay mechanical shop rest on a 50-acre paved site just three hour’s drive from both St. Louis , Kansas City and Tulsa. The sale typically runs 600-800 units each Thursday morning. The auction hosts a Specialty Sale every third Thursday of the month that features RVs, Boats, Motorcycles, ATVs and more. The auction is 70% dealer consignment sale, and 30% institutional consignors. Other services include: pre-sale inspections; 7 and 14-day Post Sale Inspections; dealer financing options including in-house floor plan; title services; Simulcast sales via Auction Pipeline; and online sales via OVE and SmartAuction. 166 is known for its weekly cash and prize giveaways both prior to and following the Thursday sale. The auction hosts an open-to-the-public Collector Car and Special Interest Sale each spring and Fall when classic cars, muscle cars, and especially Corvettes are run through the lanes.